The funeral profession is a combination of art, science, heart and soul. It is a demanding profession – physically, emotionally, spiritually and socially. It causes us to give pause and reflect on our experiences in caring for our Island community. Sometimes, we can feel isolated from others. We have chosen a profession that demands we respond with caring and empathy at moment’s notice. This often means cancelled plans, delayed holiday gatherings and little time for family and friends. Not for one moment do we question our commitment to our community and profession. To best care for the families who entrust their loved ones to us, we need to always be honing our skills, acquiring innovative tools and resources and ensuring that we follow best-practices. When the new Funeral Services and Professions Act was acclaimed in 2016, funeral service professionals were mandated to provide evidence of continuing education. The Act simply put into writing something most funeral service professionals were already dedicated to fulfilling. 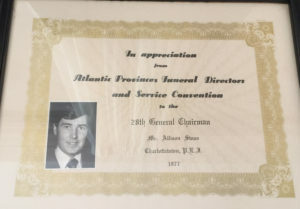 Allison Swan served as General Chairman of the Atlantic Provinces Funeral Directors and Service Convention in 1977 and 1988. This past weekend, the Atlantic Provinces Funeral Directors and Service Convention was held in Moncton, New Brunswick. The weekend featured numerous sessions on how best to care for our families and respond to the needs of our community. We were offered guidance and support from the presenters and other participants. The convention also provided us with an opportunity to reach out and engage with other funeral service professionals from around Atlantic Canada and elsewhere. The fellowship and opportunity to join in conversation, was invaluable. It removed that fleeting feeling of social isolation. Along with the education components of the conference, we were also afforded an opportunity for self-care and enjoyment, that truly nourished the soul. We look forward to the opportunities afforded to us by our continuing education programs. We were reminded once again of our noble profession and are indebted to Todd Van Beck for his recitation of “The Undertaker” by Bennett Chapple. “The Undertaker” by Bennett Chapple. A beautiful cross-stitch work of this poem is proudly displayed in the foyer of MacLean Funeral Home Swan Chapel.